Come and join our new program based around fun, interactive and water safety activities. Your Swim School memebership entitiles you to 1 x 30 minute lesson per week and free unlimited acces to our pool to practice your skills all year round! 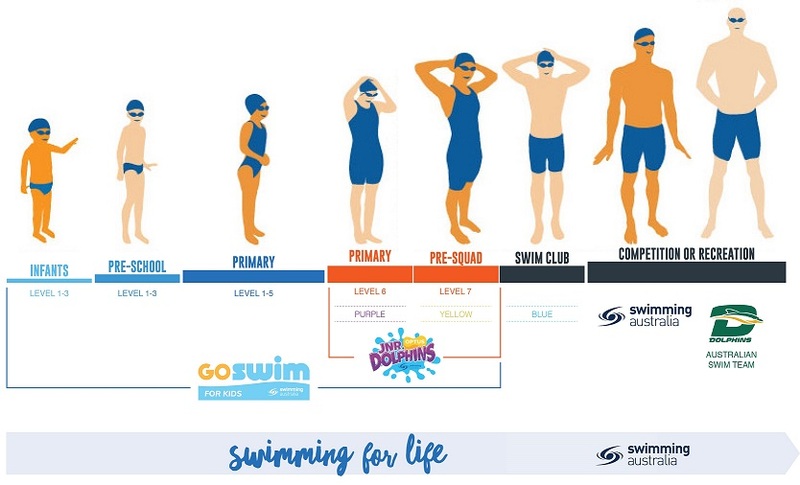 We are proud to announce that our 2019 swim program GOSWIM, is powered by Swimming Australia, a new, fun way to learn to swim and be safe. GOSWIM focuses on contemporary, experiential and activity-based learning. Simply take a look at our swim experience journey below to identify the ideal entry level for you and your loved ones. The new curriculum is powered by Optus Splash app and platform designed to enhance the swimmer’s experience, increase retention and communication to swimmers and their parents. Download the app to see your student profile and your progression report. Together we hope to put the fun back into learning to swim and keep swimmers loving our sport for longer – increasing our chances of uncovering future Olympic champions.